Risk management that addresses the risks that are relevant to retirement income. Asset allocation that balances the tradeoff between asset growth and income risk management. Meaningful communication that enables participants to monitor performance in income units. The first consideration regarding risk management is how long you expect participants’ accumulated savings to support their consumption in retirement. In the US, the average life expectancy of a 65-year-old person is 85 years. To account for uncertainty about life expectancy, we can add a five-year buffer to the average retirement horizon, resulting in a 25-year expected withdrawal period. The next step is to identify the key drivers of income uncertainty over that withdrawal period. Retirement income uncertainty is driven by market risk (uncertainty of future stock and bond returns), interest rate risk, and inflation risk. 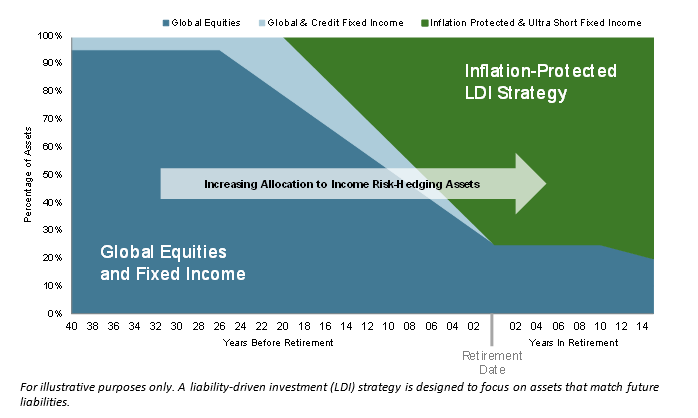 These risks can be reduced by computing the duration of the retirement income stream and allocating to a portfolio of inflation-protected securities that are duration-matched to the planned retirement horizon. This is the basis of the risk management strategy of Dimensional’s retirement solutions and the S&P Shift to Retirement Income and Decumulation (STRIDE) Index Series. This framework also helps to manage sequencing risk, as the level of retirement income that can be supported by the allocation to risk management assets is not very sensitive to market risk, interest rate risk, or inflation risk. Having identified an appropriate risk management strategy, the asset allocation question then becomes a tradeoff between allocating to growth assets vs. risk management assets. The higher the allocation to risk management assets, the lower the expected volatility of retirement income. In launching the S&P STRIDE Indices, S&P Dow Jones Indices has developed a benchmark for investment solutions that seek to grow the value of participants’ savings while managing retirement income uncertainty. This entails a focus on asset growth early in participants’ lifecycles with a transition to an income-focused strategy over time. As participants transition into retirement, the majority of their assets are invested in inflation-protected government securities matched to their retirement horizon. This liquid investment strategy can be used by participants who desire periodic withdrawals in retirement. A retirement solution should also allow participants (and their plan sponsors) to monitor progress toward a retirement income goal. This can be achieved through information that translates the purchasing power of participants’ account balances in terms of estimated retirement income. The S&P STRIDE Indices include a monthly cost of retirement income called the Generalized Retirement Income Liability (GRIL) for each retirement cohort, which can be used to translate account balances to estimated retirement income. If the GRIL goes up (down), generating a given level of income becomes more (less) costly, and the purchasing power of a given level of savings goes down (up). Because of the risk management framework in the S&P STRIDE Indices, uncertainty about participants’ future income is reduced over time so that communication in income units can be more meaningful. We believe the right risk management helps provide clarity about expected retirement outcomes and empowers participants to make better retirement decisions. Source: Social Security Administration: Calculators – Life Expectancy. The age of 85 is computed by averaging the male life expectancy and the female life expectancy for people turning 65 in 2017. GRIL is defined as the present value of $1 of annual inflation-adjusted income over 25 years starting at the target date. The interest rates used to discount these future hypothetical cash flows to the present are derived from the current US TIPS curve.